When you feel a cold coming on, time is of the essence. There are steps you can take to stop a cold in its tracks - and every hour counts. Staying hydrated cuts down on symptoms like a sore throat and stuffy nose, and may help boost your immune system. Salt water reducing inflammation and pain in the throat, and clears mucous. The rinse also flushes out bacteria and viruses, which may help whether you're getting a cold or want to prevent one in the first place. 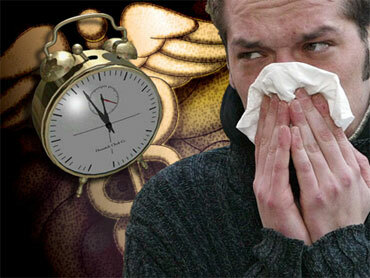 Studies suggest using a saline nasal spray right after cold symptoms appear may reduce their impact. Pain relievers such as Advil, Motrin or Tylenol can fight off achiness. Decongestants, such as Sudafed, help dry up mucous if you need to go to work. But skip the over-the-counter cough medicine. Studies suggest just sipping on tea with honey is as effective. If you feel worse or have a fever, start vomiting, or develop an increasingly bad headache, call your doctor -- those are signs you've got something other than the common cold (such as flu or an bacterial infection), and you may need antiviral medication, antibiotics, or other treatment.